Unprecedented cybersecurity challenges loom over the horizon, and today’s operational security agenda is too narrow in scope to address the wide range of issues likely to emerge in the coming years. To address this gap, the UC Berkeley Center for Long-Term Cybersecurity (CLTC), CNA’s Institute for Public Research (CNA), and the World Economic Forum’s Global Centre for Cybersecurity (C4C) created Cybersecurity Futures 2025, a global initiative that aims to shape a forward-looking research and policy agenda that is intellectually and practically robust—and broadly applicable across global geographies. Sponsored by HP, Inc. and Qualcomm, with additional support from Cybercube and Symantec, the Cybersecurity Futures 2025 project began in 2017, when CLTC developed a set of four scenarios depicting possible futures that could result from the rise of artificial intelligence, ubiquitous sensors, quantum computing, divergent internet regulations, and other trends. In 2018, the project team convened a series of workshops in seven international cities to engage experts and decision-makers in dialogue about the challenges and opportunities the scenarios depict. 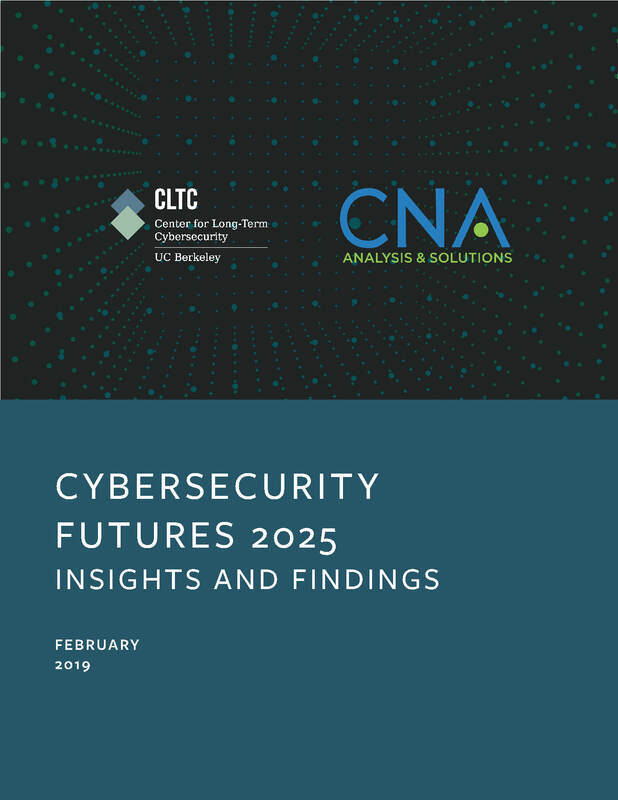 The resulting report, Cybersecurity Futures 2025: Insights and Findings, provides an overview of key findings, as well as the full scenarios themselves. A website (cyberfutures2025.org) features short videos that depict the four different scenarios and allow users to interact with some of the key ideas and insights. A brief video featuring Walter Parkes—Hollywood producer and screenwriter of WarGames, Sneakers, and Minority Report, among other films— introduces the four scenario videos. The website also includes a “decision-making heuristic” designed to help institutional leaders assess their own strategic needs and possible actions they could take today to help their organizations prepare for the future. or visit this page to learn more about this project.